The day had finally arrived. 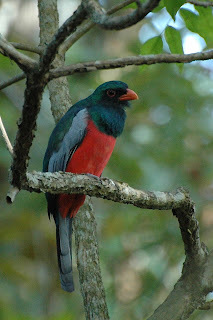 My first trip to the tropics and a chance to see some amazing birds. Because there was so much to see, and so much to report on, I've broken this section into several parts. Within each part is a description of the days events and birding highlights. Some days are shorter than others, but all proved to be very rewarding in one way or another. The journey begins. I woke at 5:00am to get to the Victoria airport for check-in by 6:00am and departure at 7:00am - first flight was on-time, and a short hop across the pond (the Strait of Georgia) and I'm at Vancouver airport by 7:20am. My connecting flight to Dallas was scheduled for 9:00am, so I just had to make the very long walk through the Vancouver airport (completely re-routed for construction) and go through US Customs. No problems so far. Birding highlights - absolutely none. I arrived in Dallas, where I would connect to Panama, on-time and went for lunch. I tried my best to spot some interesting birds from the airport terminal but it was getting dark and all I managed to see was American Crow and European Starling - not exactly highlights. The departing flight to Panama was on-time. The plane was loaded and we taxied along the runway only to learn that very shortly after leaving the gate that one of the engines wouldn't start. We sat on the runway for an hour before returning to the terminal. Everyone had to deboard and $10 food vouchers were issued to customers. In the end, we had to wait for a replacement plane, and when that arrived, we had to wait for new staff because of some kinda Union thing. We finally departed at at about 10:30pm, 3.5 hours later than scheduled. We landed in Panama at 2:00am the next morning and by the time I got by bags, went through customs, caught a taxi, and checked in to the hotel, I fell onto the bed exhausted at 3:30am. Given the 3 hour time difference from Victoria, it took 26.5 hours to get to Panama City - it would have been quicker going to Australia! Despite my incredibly late arrival time at the hotel I had enough adrenaline to get out of bed at 7:00am. Virtually all conference guests were staying at the Crowne Plaza Hotel, which was a five-star luxury hotel with all the amenities. As a birder/biologist I didn't quite fit the appearance of the typical business clientele that the hotel catered too, but that didn't matter to me - my goal that day was to get my first sampling of Panama birding. But first, a quick bite to eat at the hotel restaurant - a nice assortment of fruit and cereal, eggs fried in a copious amount of oil, and plantain - an unusually starchy banana-looking-type fruit that for me, demanded an acquired taste. With breakfast done in record time, I now needed to obtain transportation to Parque Natural Metropolitano. One look out of the front window of the hotel revealed hundreds of taxis zooming about, and one parked hotel shuttle. I asked the hotel lobby personnel for a ride to the park and within minutes I was on my way. The park was remarkably close, and took less than 10 minutes to arrive, despite what I considered to me some of the most chaotic city driving I had ever seen. I asked the driver to pick me up at 12:00pm, as that should give me plenty of time to complete a short hike at the park - boy, was I wrong. After paying the $2 fee and obtaining a park map, I set off to bird the following trails (Sendoro) which, when combined, made a loop: El Roble (0.7 km), Mono Titi (1.1 km), and La Cienaguita (1.1 km). I began birding immediately upon leaving the visitor centre, and to be honest, it was at first a little overwhelming. Orange-chinned Parakeets flew overhead by the dozens, Tropical Kingbirds flitted about the gardens, and the buzz and whir of hummingbirds was everywhere. It became obvious rather quickly that in this area Rufous-tailed Hummingbird was abundant, but you had to check every bird because at least another dozen potential species were possible in this area. Feeding along the forest margins behind the visitor centre was Crimson-backed Tanager, Olive Tanager, Blue-gray Tanager, and White-shouldered Tanager, and in the grassy areas were numerous Variable Seedeaters - all new species for me. Once in the forest, the roar of nearby traffic unfortunately muted many of the natural sounds, but there was enough activity to keep my mind off the road noise and on the birds. The next few highlights included Slaty-tailed Trogon, Dusky Antbird, Cocoa Woodcreeper (formerly Buff-throated Woodcreeper), and Plain Xenops, and before I knew it my time was almost up and I felt I had hardly begun. So much time was spent sifting through the field guide and absorbing every little detail that there simply wasn't time to complete all of the trails I had planned on walking. By the time I had to return to catch the shuttle I had only completed the El Roble trail and about 300m of La Cienaguita trail. In summary I saw 16 lifers and 22 species in total, and given the circumstances of a late start and early return, I was in fact very pleased. I returned to the hotel via the hotel shuttle and was shocked at the $20 fee - given what I had read in the Moon and Frommer's guides regarding transportation costs in Panama, I knew I had been taken for a ride, literally and figuratively. I had a quick shower and spent the afternoon compiling my notes, including lengthy descriptions of unidentified lizards and butterflies (note to self: find books on reptiles and butterflies). While updating my field book I made a point of looking out the hotel window at every opportunity and in doing so I managed to spot another six lifers, including Yellow-headed Caracara, Bat Falcon, and Yellow-crowned Amazon (Parrot). I also spotted my first Tropical Mockingbird foraging on the grass poolside at the adjacent hotel, and in turn, I was spotted by sunbathers scanning the pool area of the adjacent hotel - I'm quite certain they wouldn't believe I was looking at [the feathered variety of] birds. Once my notes were complete I went for a rather unusual tour of the city with a very eccentric local who, surprisingly, had claimed to have worked in the oil and gas sector near Edmonton, Alberta. The very speedy tour (not directed at birdwatching) yielded two new lifers: Magnificent Frigatebird and Ruddy-ground Dove. Tour highlights included Ancon Hill, an open-air market, the Presidential buildings, and the old Noriega prison. The 1-hour tour ended up costing $45 ($25 for the guide and $20 for the taxi). I later learned I had probably overpaid for that too. By 7:00pm I was in bed because travel exhaustion had caught up to me. I also wanted to be well-rested for tomorrow's professionally-guided bird tour that I had arranged two months earlier. Day 2 of birding in Panama was with a guide. I had spent several weeks researching potential choices, and although several operators were recommended, one in particular stood out: Advantage Tours Panama. It stood out because of two highly recommended bird guides: Guido Berguido and Kilo (who sadly, I've forgotten his last name and does not appear to be with Advantage Tours anymore). Given that I only had the one day, and that I wanted to maximize the birding time, I picked a destination that was reasonably close by - Pipeline Road in Soberania National Park. Pipeline Road is aptly named because it was formerly a road used to access an oil pipeline that has long since been deactivated; remnants of the above-ground pipe can still be seen in places. Anyone researching places to go birdwatching near Panama City will soon learn that Pipeline Road is famous for its birdiness. Most notably it is recognized for having held the record for most number of species seen in a 24-hour period during a Christmas Bird Count for 19 years, with a maximum single count of 357 species. It only lost its prestige as being the best Christmas Bird Count in the world when the two most species-rich countries in the world established similar counts - notably Peru and Ecuador. Now I knew I wasn't going to see 357 species, but the place had huge potential and that's why I chose to have a guided tour of Pipeline Road. Guido picked me up at 6:40am from the hotel and we departed immediately. We hadn't even left the city limits when he spotted a pair of Southern Lapwings (first lifer today) standing in a vacant field adjacent to the Marcos Gelabert airport, and shortly afterward he pointed out two Pale-vented Pigeons sitting on a wire (second lifer). The drive to Soberania Park takes about 45 minutes, but apparently varies depending upon how "birdy" it is along the way, and whether traffic and trains are cooperating. We arrived at the entrance to Pipeline Road at about 7:25am and parked about 200m before the semi-patrolled park entrance gate. We birded the forest margins and grassy areas around the car first, and the amount of bird activity was mind-boggling. Several Keel-billed Toucans were seen flying overhead, Red-lored Amazons announced their approach with raucous screams, and Mangrove Swallows floated effortlessly in the gentle breeze. Guido's keen eyesight and acute sense of hearing was immediately evident, and with the skill of a Jedi Knight wielding a light sabre, he used a green laser pointer to point either just below or above a bird so that I could find it. This was first demonstrated when he spotted a Golden-collared Manakin flitting in the dark, dense undergrowth. The number of new species started to quickly add up - Social Flycatcher, Gray-headed Kite (which I spotted! 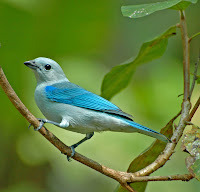 ), Bright-rumped Atilla, and Thick-billed Motmot to name a few. We also saw some "North American" species that I was familiar with - Rose-breasted Grosbeak and Magnolia Warbler (and ironically, Guido thought it was a Canada Warbler - so in a way we helped each other). We began our slow hike down Pipeline Road, first stopping at the gate to pay the $5 entrance fee. Guido continued to be as sharp as ever, calling out the exotic names of birds that he could hear, but that we could not see, until he brought out his iPod and external speaker pack. Throughout the day Guido was able to coax, lure, or attract several "hard-to-see" species into view, such as Spectacled Antpitta, Violaceous Trogon, Black-tailed Trogon, and Fasciated Antshrike (and yes, these were all lifers). As we trundled along the road it was new bird after new bird with personal highlights including Yellow-rumped Cacique, White-bellied Antbird, Ruddy-tailed Flycatcher, Black-cheeked Woodpecker, Cinnamon Woodpecker, Chestnut-headed Oropendola, and Black-capped Pygmy Tyrant (which Guido described as having a name longer than its body). Now to be clear, Pipeline Road is actually quite long (15+ km) and our plan was to walk only to the Panama Rainforest Discovery Centre, which was approximately 2 kms from the gate. Several cars passed us during our walk, which I learned later was an option for birders that wanted to start their birding further along the road; for my first visit I was more than happy with what we were doing. In addition to the birds we were seeing, we also saw numerous species of butterfly ( including the incredible Blue Morpho) and four species of primate: Three-toed Sloth, Two-toed Sloth, White-faced Capuchin, and Mantled Howler Monkey. Once at the visitor centre, where I was able cool down in the shade and have a cold Coke, the hummingbird feeders surrounding the balcony were teaming with action. The most abundant species was White-necked Jacobin, which given the seemingly abundant supply of food, seemed to fight endlessly over feeding rights. The only other hummingbird species I saw was Blue-chested Hummingbird, although I'm sure I missed some as I walked around trying to take everything in. To one side of the visitor centre I was rather pleased with myself when I located the nest of a Golden-hooded Tanager, which also was a lifer. After about 30 minutes Guido took me back to the main road where he coaxed out a Spectacled Antpitta, and while we watched this funny little tailless bird on stilt-like legs, a Blue Ground-Dove flew in and landed on a branch beside us, also offering up amazing views. As we walked back to the car Guido found a few more new species - Blue Dacnis, Blue-black Grassquit, and Red-legged Honeycreeper. I figured the tour was over, and I was very pleased with the results - I had seen 47 new species, and probably close to 70 for the day. But then I learned the tour wasn't over. Our next stop was the "ammo dump ponds", a local name for some ponds that are at the entrance to where the Panama Canal Authority stores its explosives for Canal maintenance and expansion. At the ponds we spotted Wattled Jacana, Orchard Oriole, Red-crowned Woodpecker, and Green Iguana (obviously not a bird, but cool nonetheless). We departed the ponds and drove to Guido's "research" facility, which was actually part of a semi-detached housing community in which his property borders the forest. We spent about 45 minutes at his place, sipping yet another Coke, and watching the birds at his banana-laden feeder. Thirteen species visited the feeders in the short time we were there, and two were lifers: Green Honeycreeper and Streaked Saltator. This was also one of my best opportunities to photograph some birds, as getting close was often difficult with a 300mm lens. When we left I was convinced that was the end of the tour, but still it wasn't. Now we were on our way to Gamboa, an unofficial park on the banks of the Chagres River and Gatun Lake. We spent most of our time near the small boat launch and restaurant, and in the 30 minutes we spent in the area we saw 23 species of which 5 were lifers: Purple Gallinule, Great Kiskadee, Piratic Flycatcher, Common Tody-Flycatcher, and Lesser Kiskadee. We arrived back at the hotel at 4:15pm and after a quick shower I spent two hours over dinner compiling my notes and reviewing what I had seen. To say that the tour was amazing would be a major understatement. To this day, two years after the fact, I still vividly remember the experience, from Guido's expertise, knowledge, and professionalism to the voluminous array of technicolour species we saw. Most importantly, I was looking forward to implementing the experiences I had learned in the days to follow.